PhD Candidate Catherine Cheng and Professor Hae Yeon Choo published an article that reviews the literature on women’s migration in East and Southeast Asia for the purposes of domestic work and cross-border marriage. The article highlights the interconnections between migration for domestic work and migration for marriage in East and Southeast Asia. Catherine Cheng is a PhD Candidate in Sociology at the University of Toronto. Her research interests lie at the intersection of gender, nation-state, migration, labour, and citizenship, with a geographical focus on East Asia. Hae Yeon Choo is an Assistant Professor of Sociology at the University of Toronto Mississauga. Her research centers on gender, transnational migration, and citizenship to examine global social inequality. We have posted the citation and abstract of the article below. The full text is available through the University of Toronto Library Portal here. Cheng, Catherine Man Chuen and Hae Yeon Choo. 2015. “Women’s Migration for Domestic Work and Cross-Border Marriage in East and Southeast Asia: Reproducing Domesticity, Contesting Citizenship.” Sociology Compass, 9:654-667. This article offers an integrative review of the literature on women’s migration for domestic work and cross-border marriages in East and Southeast Asia. By bringing these two bodies of literature into dialogue, we illuminate the interconnected processes that shape two key forms of women’s migration that are embedded in the reproduction of women’s domesticity. We highlight structural analyses of the demographic and socio-economic shifts that propel women’s migration while also attending to the affective dimension of migrant women’s desires and duties and to the brokerages that mediate the migrant flow. We finally examine how migrant wives and domestic workers contest the boundary of citizenship as they claim their full personhood against divergent modes of control over their rights, bodies, and mobility. We conclude by pointing out concrete areas where the two sets of literature can enrich each other for future research on gender, labor, and migration. Congratulations to Professor Hae Yeon Choo who has been chosen as a Fellow a the Institute for Advanced Study in Princeton, NJ for 2018-19 while she on research leave from her duties at the University of Toronto, Mississauga. At the Institute, Professor Choo will participate in the School of Social Sciences which defines its mission as “the analysis of contemporary societies and social change.” Professor Choo will be one of approximately twenty visiting scholars for the year. While at the Institute, Professor Choo will concentrate on a research project studying the politics of land ownership in South Korea. Her project focuses on macro-level political contestations over land rights in South Korea, together with the narratives of people who navigate the pursuit of class mobility. While real estate speculation has become a common practice among the South Korean urban middle-class since the 1960s, the advent of parliamentary democracy and the burgeoning of civil society has simultaneously challenged urban displacement based on democratic principles. It is this juxtaposition between intensive marketization forces and a counter force of mobilization based on rights and citizenship that makes the politics of land ownership in South Korea a key research site for the paradox of democracy. Professor Choo has already collected data from in-depth interviews with urban middle-class homeowners and will use the time to analyze this data and conduct discourse analysis of real estate-related self-help books, legal case laws, and archival data. She will also use her time for writing and participating in the Institute’s intellectual community. Her project will show how market logics become entrenched in everyday life, and how the politics of land ownership are shaped through collective contestations. As such, her work promises to illuminate the paradox of democratic citizenship emerging alongside deepening economic inequality. Professor Hae Yeon Choo discusses her new book on gender, migration and citizenship on the Gender & Society Blog. Professor Hae Yeon Choo’s new book was recently profiled on the University of Toronto Mississauga’s News site. A new book by a U of T Mississauga sociology professor Hae Yeon Choo reveals how inequalities of gender, race and class affect migrant workers’ rights and citizenship in South Korea. In Decentering Citizenship: Gender, Labor, and Migrant Rights in South Korea, Choo examines the experiences of Filipina women employed in the suburbs of Seoul. Choo spent 18 months observing and interviewing the women—factory workers, bar hostesses and “marriage migrants”—examining how they integrated with, or were excluded from, South Korean society. There are about 1.57 million migrants in South Korea, accounting for about 3.1 per cent of the national population. This includes about 24,000 Filipina women with temporary visas to work in factories or as “entertainers” in hostess bars, as well as about 10,000 ‘marriage migrants’ wed to South Korean men. A further 5,500 women are considered undocumented, employed in factories or performing domestic work. South Korea’s strong sense of national ethnic identity and stringent labour laws that require workers to return to their home countries keep migrant workers on the edges of society, making it difficult to integrate into the culture, achieve permanent residency or make plans for the future. “Women who come through marriage have the best possibility of long-term stabilization and permanent residence,” Choo says. Professor Hae Yeon Choo is Assistant Professor of Sociology at University of Toronto, Mississauga, and Affiliated Faculty of the Asian Institute and the Women and Gender Studies Institute. 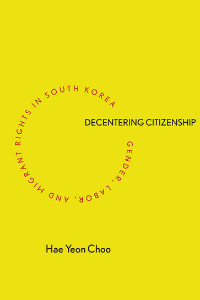 Her new book Decentering Citizenship examines the varying claims to citizenship rights of Filipina migrants in South Korea. Decentering Citizenship follows three groups of Filipina migrants’ struggles to belong in South Korea: factory workers claiming rights as workers, wives of South Korean men claiming rights as mothers, and hostesses at American military clubs who are excluded from claims—unless they claim to be victims of trafficking. Moving beyond laws and policies, Hae Yeon Choo examines how rights are enacted, translated, and challenged in daily life and ultimately interrogates the concept of citizenship. Choo reveals citizenship as a language of social and personal transformation within the pursuit of dignity, security, and mobility. Her vivid ethnography of both migrants and their South Korean advocates illuminates how social inequalities of gender, race, class, and nation operate in defining citizenship. Decentering Citizenship argues that citizenship emerges from negotiations about rights and belonging between South Koreans and migrants. As the promise of equal rights and full membership in a polity erodes in the face of global inequalities, this decentering illuminates important contestation at the margins of citizenship.